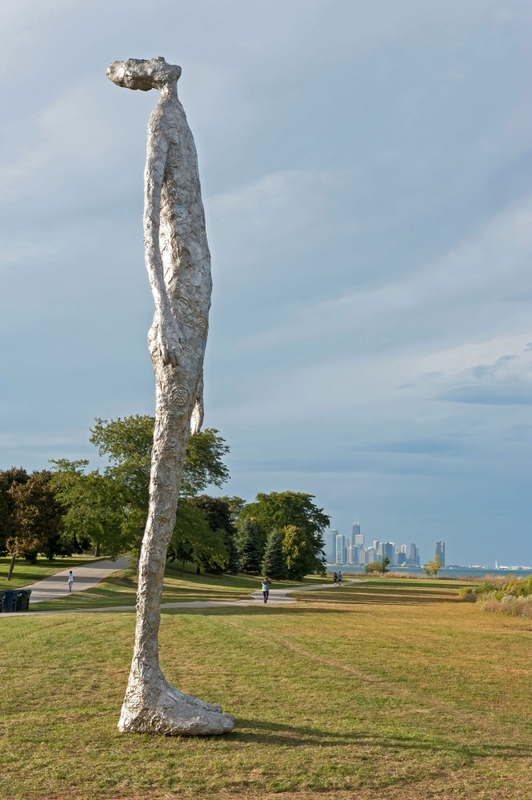 The Chicago Park District in collaboration with Luhring Augustine, New York and the Stephen Friedman Gallery, London will further accentuate the beauty of Chicago’s lakefront with the installation of Looking Up, 2015, a 33.3-foot-tall stainless steel sculpture by the American artist Tom Friedman. Looking Up is by far the most ambitious sculpture from Friedman’s ongoing body of work involving the use of crushed aluminum foil, roasting pans, and baking tins to create figures, which, through a process of molding and lost wax casting, retain the imprint of the original materials. A charming yet magnificent piece, the quasi-human figure gazes up to the heavens, inviting others to stand at its base and do the same. This is the second sculpture in the edition of 3 (and 1 artist’s proof) and was recently installed for six months in New York City at the intersection of Park Avenue and East 53rd Street; the first sculpture in the edition is permanently installed at the Laguna Gloria Campus of The Contemporary Austin, TX.